Buckley won the $1,500 buy-in No-Limit Hold’em event, which included five exciting days of poker action, and drew a door-busting 7,275 entrants. This was the sixth-largest live tournament in poker history. With the “Colossus” event completed just a week earlier, this means that the 2015 World Series of Poker has already produced two of the six largest live tournaments ever held. The prize pool for this event reached nearly eight figures, tallying at a whopping $9,821,250. Buckley’s share of the total pot came to $1,277,193. Remarkably, both of the record-sized tournaments held so far were won by two players who had never previously cashed in a WSOP (Las Vegas) event before. Cord Garcia, The Colossus champion, finished in the money for the first time, outlasting nearly 23,000 players on the way to a $638,880 payout. Buckley also made his first visit to the cashier’s window in this tournament, collecting the biggest cash prize so far of anyone through the end of 19 events completed, so far. Given the long odds Buckley faced at various points during this tournament, his recollection of the course of events is hardly an exaggeration. Entering Day Three, the eventual winner had only 6 big blinds in his stack. Coming into today’s session, he had only 10 big blinds. Then, when playing heads up, he overcame the chip disadvantage at least three times on the way to victory. Indeed, this win was unlikely as they come, especially given the pedigree of competition later in the tournament. For a tournament of such a size, it was highly unusual to see four gold bracelet winners make the final table. Most gargantuan fields produce finales dominated by lesser-known players, and relatively few superstars. However, this table was a notable exception with Erick Lindgren (2 wins), Mike Sexton (1 win), Justin Pechie (1 win), and David Miscikowski (1 win) sitting among the final nine. That said, all four busted out early in succession, as none finished higher than 6th place. “I’d never been in this spot before,” Buckley said when asked about being nervous in his first appearance on the ESPN Main Stage. “It was a little nerve-wracking. But then I took it one step at a time and things got easier. After a while, I realized ‘it’s just a poker game,’ and that’s when I really felt comfortable. But I never even looked at the prize money until we were three-handed. Arguably, the most decisive hand of the tournament took place heads-up when Buckley was down by nearly 2 to 1 in chips and was dealt A-K. He was all-in against Javier Zarco from Spain, who tabled A-3. When a 3 flopped, that making it appear Zarco was destined for victory. However, a King on the turn evaporated Zarco’s hope of winning then and there, and reversed the players’ chip counts. After some jousting back and forth for another 20 hands or so, Buckley won the final hand of the night with pocket 10s versus Zarco’s pocket 6s. The higher pair held up, giving Buckley the win, as a wave of supporters poured out of the gallery and onto the stage to congratulate poker’s newest millionaire. Buckley is a graduate of the University of Colorado. He is employed as an electrical engineer by defense contractor Lockheed-Martin. Buckley loves his work and plans to go in when he returns home to Colorado. However, he will also pursue his poker dream here during the remainder of the series. Second Place: Javier Zarco, making only his second career cash at the WSOP in Las Vegas (in addition to three WSOP Circuit events), collected the biggest cash prize of his career to date, for coming in 2nd. The runner up finish was worth $791,690. Zarco is a 24-year-old MBA graduate from Madrid, Spain. He came close to joining his fellow countrymen Carlos Mortensen and Adrian Mateos as the only Spanish players who have won titles at the WSOP. Third Place: Oliver Busquet, a 33-year-old poker pro from New York City finished 3rd. 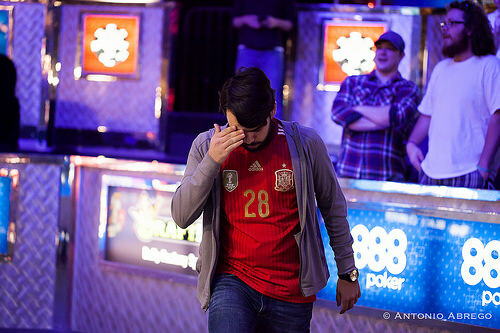 He had the chip lead a few times when play was three-handed, but lost some critical confrontations late and ended up with $589,569 to compensate for the missed opportunity at what would have been a first gold bracelet. This marked Busquet’s 24th time to cash at the WSOP, and rocketed his earnings up to more than $1.2 million since his first cash here back in 2008. Fourth Place: Randy Pfeifer, a 44-year-old retiree from Lancaster, NY finished 4th. He pocketed $441,465, which was more than four times the total earnings he’d enjoyed up to this point in 9 previous cashes. Fifth Place: Mohammad “Sheddy” Siddiqui, a 37-year-old poker pro from Pembroke Pines, FL took 6th place. He earned $333,038, by far the biggest cash of his poker career which began in 2010. 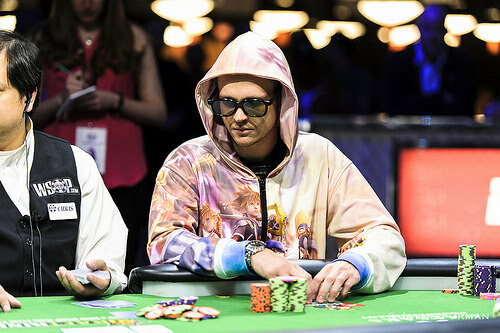 Sixth Place: David Miscikowski, from San Diego, CA outlasted more players than ever before, but missed out on his opportunity to win a second gold bracelet within two years. Miscikowski, winner of last year’s $5,000 buy-in No-Limit Hold’em tourney, added $253,093 this time to his poker bankroll. Seventh Place: Erick Lindgren, a.k.a. “E-Dog,” was aiming for what might have been a third gold bracelet in this event, but ended up finishing 7th. Lindgren, winner in 2008 and 2013, couldn’t establish any consistency despite being aggressive early on, and settled for a payout worth $193,675. This marked Lingdren’s 42nd time in-the-money, pushing his career WSOP earnings to more than $3.4 million. Eighth Place: Justin Pechie, a 30-year-old poker pro from Thompson, CT finished 8th. He pocketed $149,283 in what was his 22nd cash at the series. Pechie won his gold bracelet in 2011 in the $2.500 No-Limit Hold’em Shootout. Ninth Place: Mike Sexton, one of the game’s most popular personalities and best goodwill ambassadors finished in 9th place. The Poker Hall of Famer, Tournament of Champions winner, and gold bracelet winner from 1989 added to his long legacy with his 61st career cash at the series. Sexton earned $115,890 in prize money. In addition to Lindgren and Sexton, among the gold bracelet winners who cashed in this event were Steve Zolotow, Blair Hinkle, Hoyt Corkins, Justin Bonomo, Larry Wright, Brian Rast, Ronnie Bardah, Jeff Madsen, and others. The average age of players was 38 years/8 months, which was slightly higher than average. There were 6,961 male and 314 female entrants. There were 5,853 American players and 1,422 entrants from other countries. There were 334 players who played in this as their first WSOP event. The oldest player was James Winter, at age 83. Adrian Buckley raises to 2,000,000 and Javier Zarco quickly moves all in for 17,000,000. Buckley calls and tables . Zarco can only table and Buckley's rail are dancing. 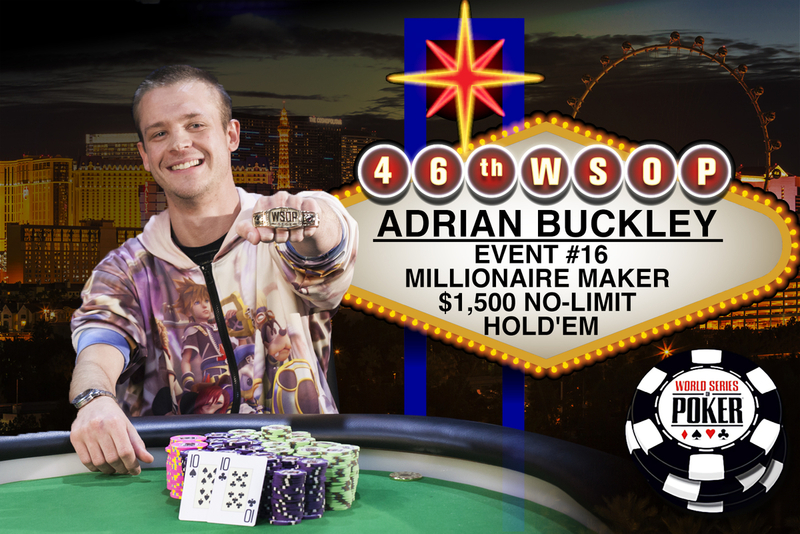 The board runs out and Buckley wins the hand, the Millionaire Maker title, the $1,227,193 first prize, and of course, the gold WSOP bracelet. Adrian Buckley gets a walk. Adrian Buckley raises to 2,000,000 and Javier Zarco calls. The flop is and both check. The turn is and Zarco bets 1,700,000, which is enough to take the pot. Javier Zarco raises to 2,000,000 and Adrian Buckley calls. The flop is and both players check. The turn is the and again both check. The river is the and Zarco bets 2,000,000. Buckley calls and Zarco shows to take the pot. 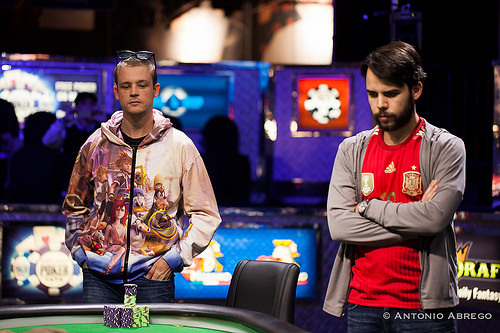 Adrian Buckley calls, Javier Zarco shoves all-in, and Buckley folds. Javier Zarco calls, Adrian Buckley shoves all-in, and Zarco folds. Adrian Buckley calls and Javier Zarco checks. The flop comes . Zarco checks, Buckley bets 2,000,000, and Zarco calls. Zarco bets 1,800,000 when the comes on the turn, and Buckley calls. Both players check the turn and river. Adrian shows to take the pot. The flop comes [5g]. Buckley checks, Zarco bets 2,300,000, and Buckley calls. Buckley tables for aces and queens to take the pot. Adrian Buckley raises to 2,000,000 and Javier Zarco calls. When the hits the river, both players check. Javier Zarco raises to 2,300,000 and Adrian Buckley folds. Javier Zarco gets a walk. Javier Zarco raises to 2,300,000 and Adrian Buckley calls. The flop comes out and Buckley checks. Zarco bets 2,400,000 and Buckley folds. Adrian Buckley calls and Javier Zarco raises to 2,000,000. Buckley folds. Javier Zarco raises to 1,600,000 and Adrian Buckley calls. The flip is and Buckley check-calls a 1,600,000 bet from Zarco. The turn is the and both check. The river is the and both check again, Buckley tabling to take the pot. Adrian Buckley raises to 1,600,000. Javier Zarco three-bets to 4,200,000 and Buckley folds. Javier flashes as he mucks. Javier Zarco raises to 1,600,000 and wins the pot.